Put the water and all the spices in a pot on the stove and heat just to a simmer. Turn off the heat and add the tea bag. Let it steep for 10 minutes. Strain the water, and then put it back into the pot. Add the oats and bring back to a simmer and cook for about 10 minutes until the oats are done. 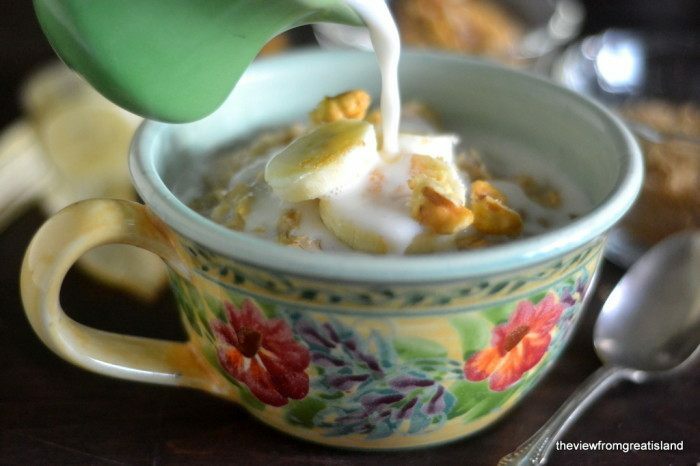 Add the brown sugar and vanilla and serve hot with almond milk, bananas, more brown sugar, and walnuts.